The political soap opera “former Viet Cong soldier Nguyen Van Hai aka Dieu Cay” has not been cooled down then other political episode of poisonous snake has already started and created headlines on the internet websites. But the most important thing that the Vietnamese inside and outside Vietnam with the spirit of Fatherland – Pride – Responsibilities should think thoroughly on every single word and sentence, political events and other newly born political figures who have been supporting and polishing Canadian Senator Ngo Thanh Hai. This senator was appointed by Canadian Senate, not an elected senator. Due to fierce protests of the authorities of Viet Cong, the name of this legislation has been changed to “The Law of Journey to Freedom” (Sic). Note 1: It means so-called “The Law of Journey to Freedom” has been confirmed to change its name to meet the “fierce protests” of the authorities of Viet Cong. “To the Vietnamese Canadians and the Vietnamese communities who are currently living in the countries outside Vietnam, the 30th Day of April is the day when Vietnam fell into the hands of the dictatorship and oppressing communist regime which does not care about human rights”(Sic). Question: Who invoked the “fall” of Vietnam into the hands of the dictatorship and oppressing communist regime which does not care about human rights”? It was factual that the Republic of Vietnam and Vietnam (as a nation) was invaded by the USSR and China. And the so-called “The communist party of Vietnam” and its affiliated political, military, economic and social organizations were only the politically malicious Vietnamese (Viet Gian) in which these communists have affirmed by carving the notorious declaration at the tomb of former Secretary General communist Le Duan:”We fight Americans/ Vietnamese and this fight is for the USSR and China”(Sic). Therefore, there was no natural fall of Vietnam like Mr Ngo Thanh Hai’sstatement above. Being invaded and governed by the invaders then the unneeded phrase“Dictatorship, oppression, without care about human rights" (sic) are only paper flowers to hide a suppressing political regime which was created by the expansionist USSR and China and gave it to Viet Cong whom they have Vietnamese originality and look-alike face appearance so the USSR and Chinese expansionist identities can be masked up and hidden tactfully before the international communities as well as the Vietnamese who have not been well informed and have been brainwashed in the systematic propaganda schemes which have been initiated not only by Viet Cong under the full sponsorship of the USSR and China but also with the western specific interest powers therefore the people cannot differentiate between facts and communist political propaganda. “We remember the 30th of April was a dark day because it was a sad day, we already lost our country, lost families, lost friends, lost homes, lost freedom and lost our democratic rights. It reminds ourselves a day of loss and sadness” (sic). It is not in Vietnam history but also in international history there are many historic examples that one cannot use the concept of “losing country” when that country is still run by the people who continue enriching the benefits for that country. Example 1: The democratic revolution in 1789 in France which overthrew the kingship regime to begin a new political regime that was totally new and quite different from the previous kingship regime. But no one has indicated that the French people in the democratic regime had lost his country. Example 2: When the Great General Quang Trung crushed out the invading Thanh regime in Vietnam and eventually ended the governance of Le Trung Hung. Even the northern people in Vietnam at that time under Le – Trinh regime never thought that they lost their country but they were real proud to be under the leadership of General Quang Trung. Therefore when Senator Ngo Thanh Hai stated “We already lost our country” (sic) it means he himself confirmed that the Vietnamese communists are subordinates of the foreign invaders to invade the Republic of Vietnam and established the red colonization regime which has hidden the name of Republic Socialist of Vietnam. When Senator affirmed that the invasion of Viet Cong to the Republic of Vietnam has stripped off its people’s freedom and democratic rights” then he also conscientiously or unconscientiously affirmed that under the Republic of Vietnam the people did have true freedom and democratic rights. 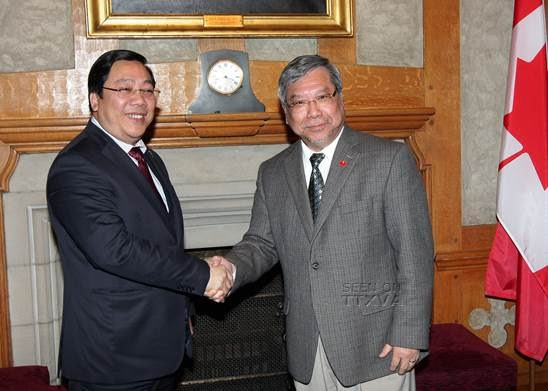 Senator Ngo did not have political guts to report to Canadian senate that in his own assessment the Vietnamese communists is only a dictatorship and suppressing regime which does not care about human rights (in fact, Vietnamese communists have wiped out all human rights of the Vietnamese people because in reality these people have been transformed into “red slaves”. Note 4: It is strange that one cannot understand why an active political figure who became a Canadian senator, even though having been an appointed senator, but Mr. Ngo Thanh Hai does not remember Vietnamese ancestors’ teaching “Honesty is father of maliciousness”. Reading the reports on Senator Ngo Thanh Hai’s piece of legislation people recognize that sometimes it is referred as “Recognition of the 30th day of April is an international day to commemorate the exodus of Vietnamese refugees who fled Communism and the welcome of Canada” (sic) then it was changed to “Bill of the Day in Black April” then finally “due to fierce protest of Viet Cong so the name of that bill has been finally changed to “The Law of Journey to Freedom” (sic). 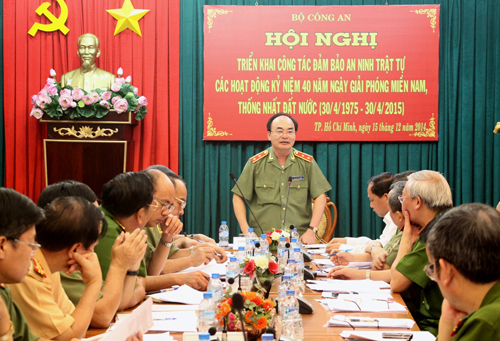 Therefore, the Bill with its formal name “The Law of Journey to Freedom”should be considered a fully intentional cooperation between Ngo Thanh Hai and the “authorities of Viet Cong”. It is clearer to confirm that “The Law of Journey to Freedom” has been authored by Viet Cong and Senator Ngo Thanh Hai has only bent down his head and knees real low to accept it without any contributions and initiatives. 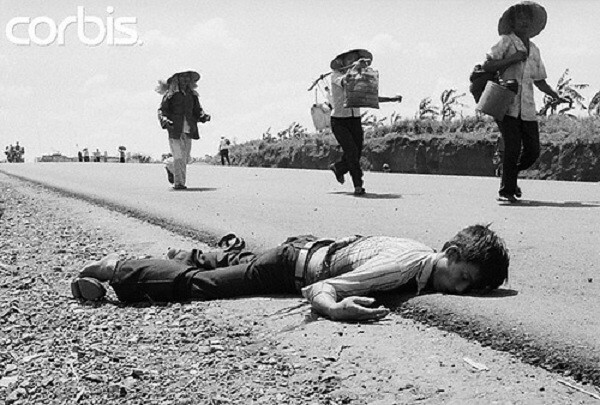 Because for decades everybody understands that every year on April 30th, the Vietnamese refugees always call that day the “National Mourning Day”. The Reformed Party (Viet Tan) created its unjustified ways to wipe out the word “Mourning” and replaced it by another name that has caused much misunderstanding of the meaning of that word. Now, Mr. Ngo Thanh Hai, Canadian appointed senator is not only chewing again the rag of Viet Tan Party (its party name has been changed to “VIET TANH”, meaning “PARTY/ GROUP OF FISHY POLITICAL JERKS”) but Ngo also considers the 30th day of April a “national anniversary”. We would like to ask Mr Ngo Thanh Hai, a long-time resident of Canada, if he still understands the meaning of the Vietnamese words and sentences. Does he understand the opposite meanings between “National Mourning Day” and “National Anniversary” when he names the 30th Day of April? Only Viet Cong are happy. And who agrees with them? Mr Ngo, This is a friendly reminder to you so you can refresh your mind and understand Vietnamese language with its accurate meaning of whatever inside your own statements. When mentioning about “The National Mourning Day” it means that day (April 30th) was a nationwide funeral day of the whole Vietnam. Commemorating “the National Mourning Day” is a reminder that the Vietnamese refugees have to remember their goal is to fight Vietnamese and Chinese communists to regain their country, the FATHERLAND of VIETNAM. It means they have to work hard by all means, generations after generations, to push out the Communist invaders off Vietnam who are only subordinates of the USSR and Red China. That is the only way the Vietnamese refugees will not have to live as refugees in other countries without having their meaningful fatherland. Meanwhile, if the exodus of the Vietnamese has only one goal of “The Journey to Freedom” then after being settled down in another country, such as in Canada, then the regaining their fatherland is not the top goal of the Vietnamese refugees. It means the Communists consider that day is their “national anniversary”. Therefore, this is a strong and proven proof that Ngo Thanh Hai’s “political thoughts” have been perfectly matched and cooperated with “the invasion strategy” of Viet Cong who always follow Secretary-General Le Duan’s national strategy “We fight Americans/ Vietnamese but our fight is only for the USSR and China”. The communists recognize the 30th April, 1975 (when Viet Nam became a red colony) as a “national day” then Ngo Thanh Hai also recognizes the day the Communists took over power in South Vietnam as a “national day” as well. Now, the audience inside and outside Vietnam, especially the Vietnamese refugees around the globe fully understand who Ngo Thanh Hai is and recognize if he is a spoiled, rotten child of Le Chieu Thong or a good kid Great King Quang Trung? Author Nguyen Ngoc Sang on Ba Cay Truc website calls on supporting signatures for Ngo Thanh Hai’s Legislation “The Journey to Freedom”. It is our heartfelt reminder and also an urgent call on the thoughtful consideration of our respectful elderly, spiritual leaders, organizations leaders and all Vietnamese refugees around the world to think thoroughly before signing your names to support Ngo Thanh Hai’s political tricks. 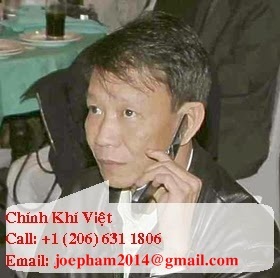 Via emails we can also reveal the true political identity of Ngo Thanh Hai. We will determine to stop the communists who use our National Morning Day 30th Day of April by flying our own national yellow flag (yellow background with three red stripes) to “celebrate” along with the Communists on this nationwide horrific day. Please remember that if we are in Ngo Thanh Hai’s fraudulent political game and are “happy” with the “national anniversary of April 30th” then it is not different than we fly our own national yellow flag to surrender the cruel Communist traitors. With our due respect, we would like to remind that we must consider this is our top and utmost important responsibility to destroy maliciously political ploys of the Communists who usually use “robots” to invade and control the Vietnamese refugee communities and force us to surrender them by using our own national yellow flag.